Nov 27, 2014 • Whether it’s cranberry relish, cranberry fluff, cranberry sauce, cranberry salad, or cranberry salsa you’ll be enjoying today, it’s fun to see where cranberries grow. A series of commercial cranberry beds can be seen on this Oct. 6, 1999 Landsat 7 image. Little Trout Lake and Ike Walton Lake (on the edge of this image) are surrounded by Powell Marsh, a vast non-forested peatland wetland complex. Linear patterns within Powell Marsh are primarily caused by old drainage ditches, and indicate the complex hydrology of this wetland. 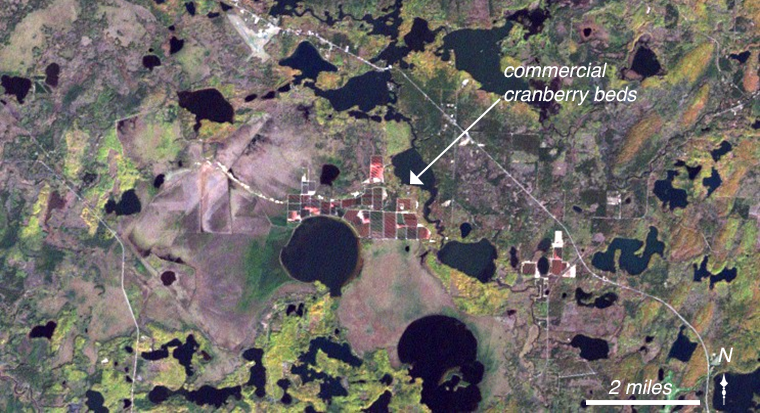 Extensive commercial cranberry beds are located on the northern shore of Little Trout Lake. Cranberries are harvested in the early autumn, typically by flooding the beds in which they are grown and causing the bright red berries to float to the surface. This entry is filed under News, Throw Back Thursday.